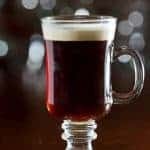 Learn how to make a traditional Irish Coffee using black coffee, sugar, Irish whiskey and a float of whipped cream. Fill a 6-ounce glass with very hot water to preheat it, then empty it out and replace it with 4 ounces of hot coffee. Add the sugar and stir until dissolved. Add the Irish whiskey, then gently pour the whipped cream over the back of a spoon so it floats on the top. For best results, whip a small amount of heavy cream until it lightens and thickens slightly, but is still pourable.